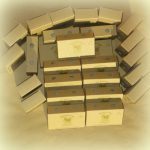 Goat Milk Soap New Zealand Palm Oil Free | Unscented for sensitive skin. Natural care for eczema and psoriasis. Palm Oil Free 2 bars Milk Relief Soap™. NZ postage $2.07 including GST additional. Milk Relief Soap™ – Proudly Made in New Zealand from scratch at our farm in Te Anau, Fiordland, in the South Island. SKU: MRSZ2. Tag: Goat Milk Soap.